*stares at that list* I feel like I’m missing something important on that. And would you be able to complete a to do list that said that? sure, we'll have a bake sale! :D :::sighs::: i'd smuggle you and tamm over if i could. okay so if you all had a choice, we'd head to hawai'i, squat at my mom's house and tour the island... snorkel, volcanos and food. what more could you need? :::nods::: MUCH better use of time. How could we resist the kitten-wistful? I'm afraid if I go back to Hawai'i I might never /leave/. oh nooooo... you have to go to my home islands! okay so i'm spoiled because i've got a place to stay for free but still~! a bed and breakfast on a kona coffee plantation. ooooo. are they on the big island? that's where we'd end up. although i do need to hit kane'ohe again to visit the valley of the temples. :::nods::: generations for us too... um... back in BC, really :::grins::: heh.. oh hell yes, keep ANYONE who makes chocolates. abduct them if you have to. that is the buddhist temple at the end of the valley of the temples in kane'ohe, o'ahu. 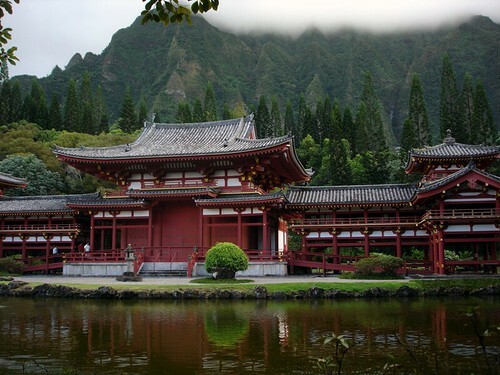 it sits at the base of the ko'olau mountains and if you go early in the morning... bring a cup of coffee, feed the koi and watch the mists rise up from the valley until the whole temple is revealed. you can't hear any city noise, just the dripping of the rain forest and the waterfalls that come down the mountain when it rains. one of the most peaceful places in the world for me. they welcome visitors and people who just need to sit and...breathe.